My staff always knew when I had a coaching session coming up and they looked forward to it as much as I did. They knew how much it fortified and empowered me. Diane’s wisdom and guidance helped me to navigate a difficult time–being new to an organization and new to an industry. She was such a lifeline for me, helping me to rise above my struggles into a deeper understanding of my work as a leader. 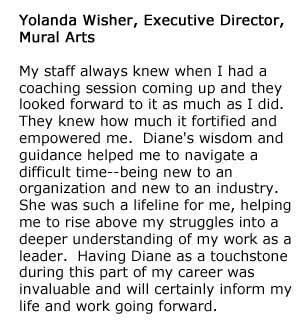 Having Diane as a touchstone during this part of my career was invaluable and will certainly inform my life and work going forward.